My grandfather, J. V. Gallegos, serving as a district judge, had been designated by the Chief Justice of the Supreme Court of New Mexico to hear this particular case, Lindley v. Lindley. It was a suit brought up against Mrs. Lindley regarding her competency to make business transactions, mainly focusing around some large payments, realty transactions and cash donations that did not sit well with other family members. Effie’s late husband was a prominent Clovis area businessman, J. E. Lindley. 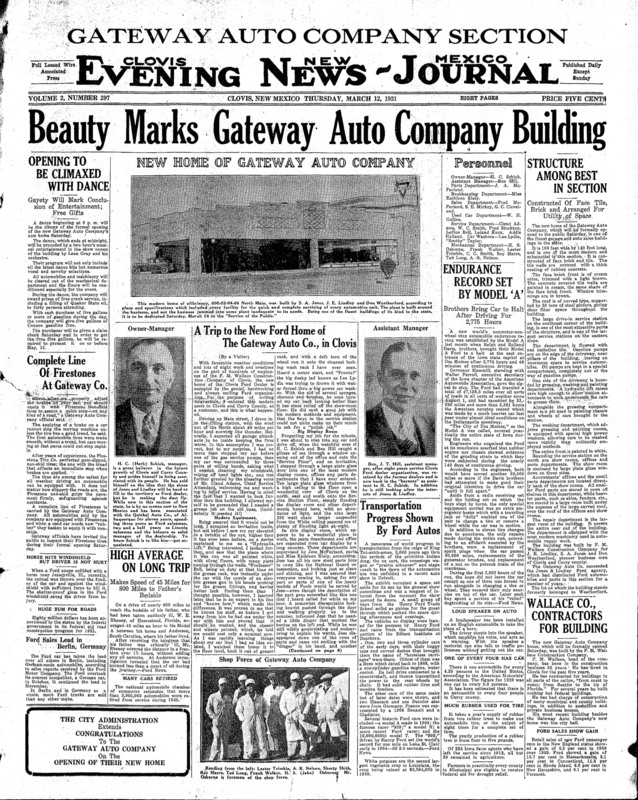 According to newspaper articles, J. E. had built a business around the early auto industry in eastern New Mexico. For instance I found a 1919 Fordson Tractor with “Jones and Lindley” agents advertisement as well as a large spread in the Clovis Evening News Journal in 1931 about the new home of Gateway Auto Company built by S. A. Jones, J. E. Lindley and Don Weatherford (image: Gateway Auto Company Section). The Lindleys were living in California, when J. E. died suddenly in 1936 (Image: Body of Lindley on Way to Plot, Greenfield, Mo) . After his death, Effie moved back to Clovis, New Mexico. The Lindleys had one daughter, Gail. 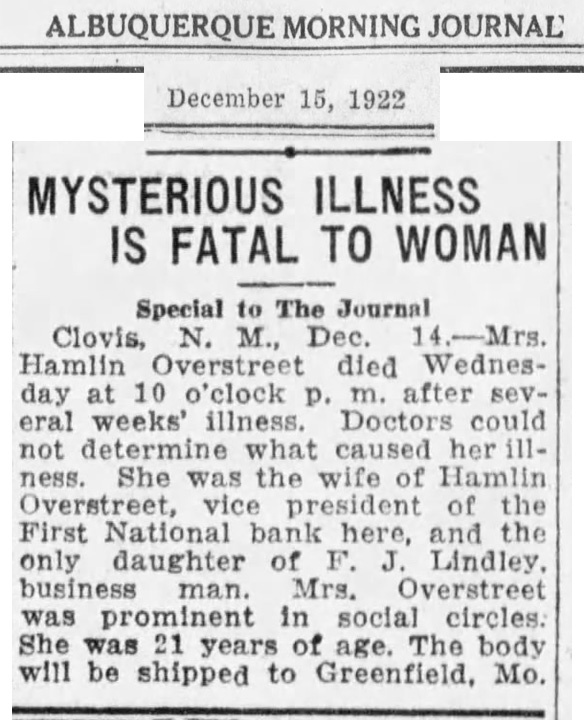 She had been married to Hamlin Overstreet less than a year, when she died in Clovis at the young age of 21 from a mysterious illness in 1922 (Image: Mysterious Illness is Fatal to Woman). By 1925, Hamlin had returned to his old home of Farwell, from Clovis, and was working with the famous 3 million acre Texas ranch that bordered much of New Mexico, XIT (Image: Pioneer Recalls Roaring Days of Farwell, Texico). Hamlin himself, had some great history of the area to tell as well. By the time my grandfather was designated to hear the Lindley case in 1956, many years had passed since Effie had lost her one daughter and husband. 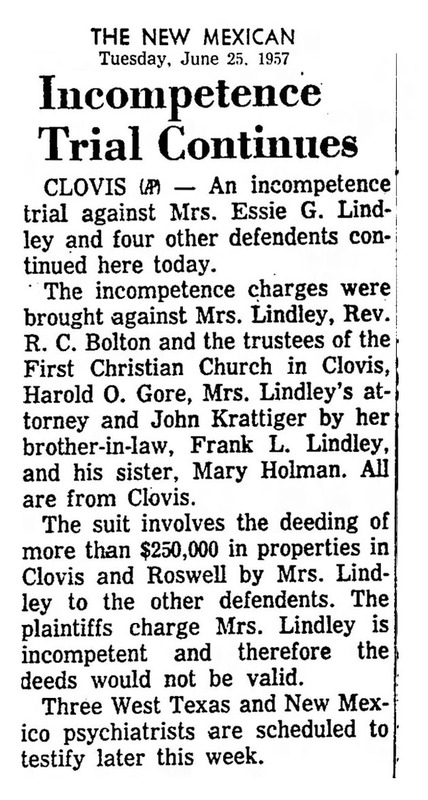 I found some background details on my grandfather’s case online from a later 1960 appeal to New Mexico Supreme Court. The court document states, “The facts before this court are extremely long and complicated…” and goes further to explain that the trial before the Honorable J.V. Gallegos, sitting without a jury, required two weeks and included sixty-two witnesses, fifty-three exhibits, and a transcript of 2,458 pages comprised the record on appeal. I was designated by the Chief Justice of the Supreme Court of New Mexico to hear this case. Mrs. Lindley, an elderly, widowed, petite woman with a hearing deficiency began to generously dispose of her property by deeding one business building to her lawyer, Harold Gore. She deeded a building to her accountant and gave $25,000 in cash to her church. Mrs. Lindley and her husband had executed a joint will. The survivor of the two would have control and use of the property in such a prudent manner as the survivor desired. Upon death of the surviving spouse, the property would go to relatives, some to her relatives and some to his. Mrs. Lindley didn’t like some of her husband’s relatives. They lived in Missouri. They were to receive a large farm in that state and other property in New Mexico. She had deeded some buildings in Clovis but reserved a life estate. This mean she could use the property and receive the rent from said property for as long as she lived. Upon her death the property would go to the grantee. As I recall, five psychiatrists testified. Three testified one way and two the other way. It mostly came down to having to rely on layman’s testimony of the person’s who signed lease contracts. During that testimony, one admitted she drove a hard bargain. I asked the attorneys for the plaintiffs if they wanted to call her. They also did not want to call her as a witness. The court called her. We heard her testimony in my chamber with an attorney from each side present. The lawyers questioned her. She pulled out the deeds. They had been enlarged to facilitate her failing vision. One lawyer asked her, “Who is the President of the United States?” She snapped, “What’s that got to do with the case?” She was right, the issue was her competency to transact business. There was quite a bit of property involved in the suit. I returned to my chambers with the court reporter to think about a decision. The defense appealed the case to the State Supreme Court. In due course, my decision was affirmed. One justice dissented but did not write an opinion. That was the end of the case. There were eight or nine volumes of testimony given which the court reporter had to transcribe. 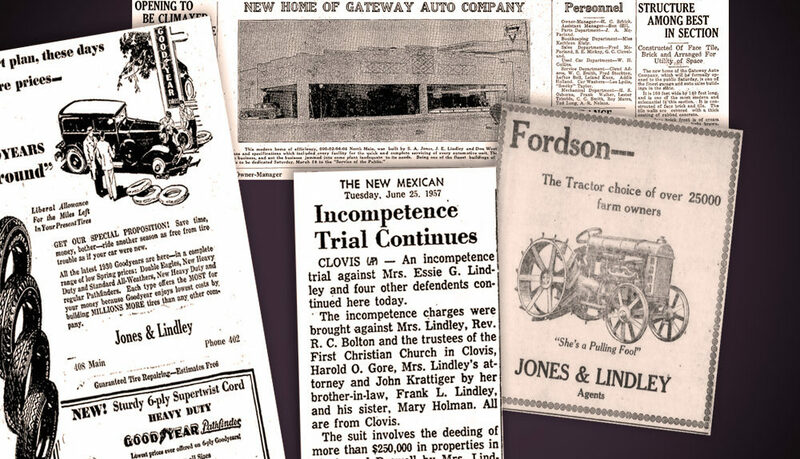 From the 1960 appeal to New Mexico Supreme Court documents, the reserved life estate provided Mrs. Lindley a monthly income of between $2,300 and $2,400. The estimate as to the value of the New Mexico realty involved in the gifts during the case ranged from four hundred thousand to six hundred fifty thousand dollars. 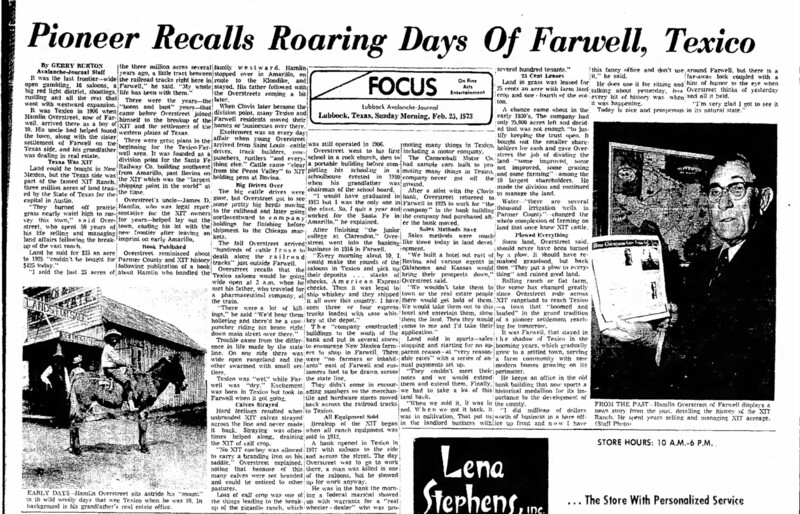 In 1969, Mrs. Lindley passed away in Clovis at the age of 87 (Image: Mrs. Lindley Dies After Long Illness). Her body was transported back to Missouri, like her husband’s and daughter’s upon their passing.